The first day of fasting in the holy month of Ramadhan is almost over and as my first break fast meal this year; I've decided to go for something yummy from the mighty spicy Ayam Penyet or Smashed Fried Chicken restaurant. 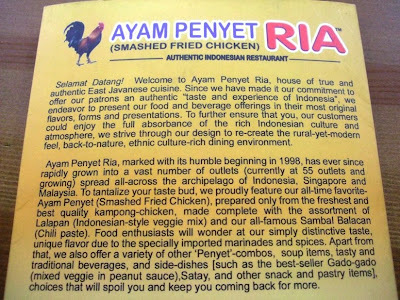 Serving delicious authentic East Javanese cuisine, Ayam Penyet Ria serves the best smashed fried chicken I've tasted so far, simply because the sambal (chilli paste) is not only tasty but super spicy as well! Even I, the Chilli Queen find my eyes all teary from the heat of the chilli! And yet that is what makes it so tasty. Like I always say, it is all in the sambal and this restaurant serves the most delicious and hottest sambal too, which makes dining here absolutely divine. I've tasted the Smashed Chicken and Prawn but I have yet to taste the fish. Maybe I'll go for the fish next time but tonight, I am having Smashed Prawn once again. Both dishes are served with boiled kangkung and cabbage, cucumber, fried bean-curd and a generous serving of sambal (I always ask for extra). It's coming up to almost 6.45 pm here so that means I have less than an hour before B and I can sit down and break fast together. We always have the hardest time thinking what to have for dinner but tonight all that's taken care of with a spicy hot meal at Ayam Penyet Ria. Bon Appétit! 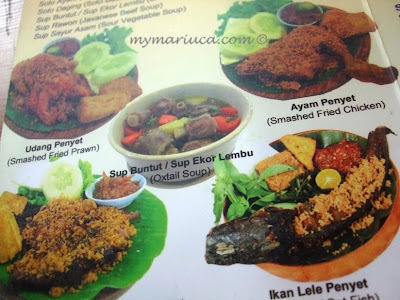 the ayam penyet looks so yummmmmmmy!!! :* :* :* :* Hola Guest! Uw your teasing me with all this lovely authentic food! 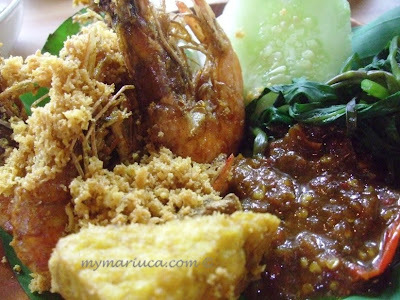 Sedap la the udang today Debbs, must ask for extra “crispy” as they call it! Recent blog:=- 20 Whacky Eggs Photos! I think for you it will be very very very very spicy, for me very very spicy…. B says it’s 8.5 spicy! hahahahhah B says it�s 8.5 spicy huh! my dropaholic widget oso MIA Mariuca! Yeah he cannot tahan pedas lol! Ralph is the one who likes spicy food right? I went to the site but there was no notice or indication of anything being wrong…if it doesn appear soon I might just remove it! what abt other ppl's blogs ah? A- though, and she was a bit worried, but I told her that it's still an A.. Yes Marzie, it's been weeks.. Maybe dropaholics don't know about it? So cute that she was worried abt that A-! She deserves a big fat hug from everyone here! Roasted chicken sounds delish Ane yum! What else? Ha ha.. Irritating right having an empty widget at our blog? LOL! How can they not know abt it eh? Dunno how much longer I wanna host a MIA widget at my blog Ane! Wow that looks yummy and I bet it will be after fasting!! I tried to make it over but I am having an incredibly busy day here. Between my handyman and my phone I haven't been able to get anything done yet!! this looks like a scrumptious feast Mariuca!!! Hola Marzie... it is a rainy Sunday morning in the Roxiticus Valley, and I'm getting ready to pack up and head to the beach for a couple of weeks until London and Maddie go "back to school." I feel like I'm going nuts, I was trying to catch up on all of the posts I missed on my favorite blogs, and now I think I imagined a whole bunch here... around Wednesday, didn't you write a really sad, poetic post? Gone?! Did Roxy dream it up? 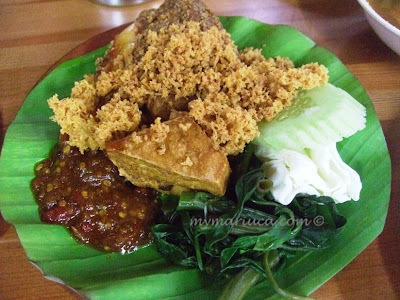 and just got back from pasar juadah.. will take come photos before I eat for sure..
Btw.. how are you and B today? All better from the flu bout?